I recently walked into my allotment to find a Bangladeshi friend looking enquiringly at my poppies and asking “Are those poppies … like in Afghanistan?”. The answer was yes, but I’m afraid opium poppies aren’t as interesting as they sound. You need a hot climate to make much of the ingredient that gives them their Latin name, Papaver somniferum. On the other hand, they do produce very tasty seeds, enough of which tend to get spilt to ensure that if you sow them one year you will have them coming up for ever more. The way the seeds are shed is very elegant and pretty handy. The spherical green seed capsule slowly dries to brown and as it does so it reveals a ring of pores around the plate at the top. If you turn it upside down the seeds cascade out like a pepper shaker. I pick them off just as they turn and put them into a large bowl. A bit of shaking up and almost all the seeds fall out into the bowl. When fresh, the seeds have a delicious nutty flavour that makes me quite happy to just scoop them out of the bowl and eat them by the spoonful. Being seeds they are particularly nutritious and full of protein. I also use them in more traditional ways in baking bread. In world cuisine, poppy seeds have much wider uses. In central Europe, they are often made into a paste for filling pastries and in the Balkans there is a poppyseed version of halva that I like the sound of. The one that I think I will try myself though is their use in making korma curries. The seeds are dry-fried, then ground and added near the end of cooking. Although poppy seeds keep for a long time, they lose their nuttiness, which is probably the poppyseed oil evaporating from them, so they are best used within a few months. 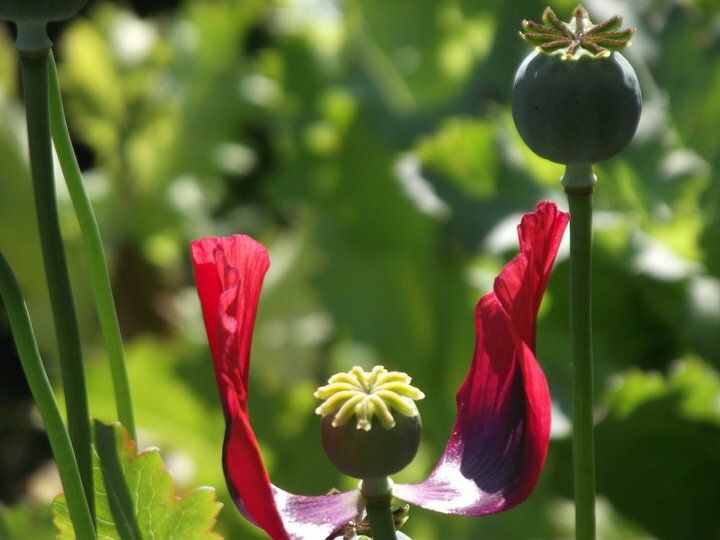 This entry was posted in Recipes, Species and tagged cooking, forest garden, gardening, opium poppy, papaver somniferum, plants, poppy, scotland. Bookmark the permalink. Hello, I really like this blog. Have you noticed any difference in your mood eating these poppy seeds? I read that Eschscholzia californica seeds should be used as they have mood stabilizers instead of the mood destabilizers from the somniferum. Have you eaten any of the orientalis variety? Hi Amanda. No, I haven’t noticed any mood-altering effects. The plant needs to grow in hot climates to produce opiates so I wouldn’t expect any. I wouldn’t be very keen to try Californian or oriental poppy seeds as they both get 1/5 flavour ratings from Plants For A Future and come with toxicity warnings. Californian poppy also has very small seed heads which would make harvesting decent quantities a bit of a chore.